You often hear people describe sports leagues as copycat leagues. Whenever a team does something different, the rest of the league is quick to adopt their own version of it. In the NHL, over the last several years, teams have largely adopted the 1-3-1 as their default Power Play formation. While this is certainly dangerous due to the multitude of passing and shooting options it presents, it is also a look teams have seen before and know how to defend it. They may not always be successful, but teams know what to expect. Today I’m going to talk about what I think should be a team’s default Power Play formation, something that no one really does in 5v4 situations. This is to run the power play from behind the net. 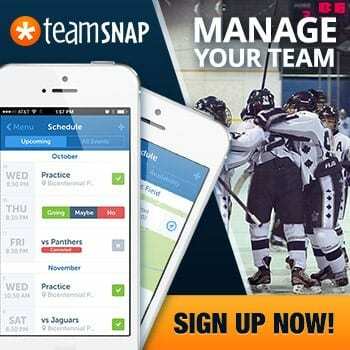 I installed this with the team I coached this past season and it worked quite well. I’ve also heard from a variety of other coaches that tried it and reported success with using it. So, how did I arrive at the decision to install a power play below the goal line? Analytics. A big focus in my work over the years has been game strategy and isolating specific shot sequences. What are more efficient ways to score? How can we do this? My first piece on the topic was two years ago. I revisited it last year, and plan on doing so again in the near future. In addition to analyzing these plays, goaltenders aren’t a fan of this style of play and so it can have an impact later on in the game as well. The findings are simple: shots that are created from passes originating below the goal line have a significant relationship to future scoring. How can you build a power play around this offensive concept? Let’s walk through it. This is a basic set up of what I ran this past season. I’m not a huge stickler for handedness as I encourage players to rotate and switch positions as that is more effective than remaining stationary and trying to force feed certain players based on handedness; however, we did find that players were more comfortable below the end line on their off-side. 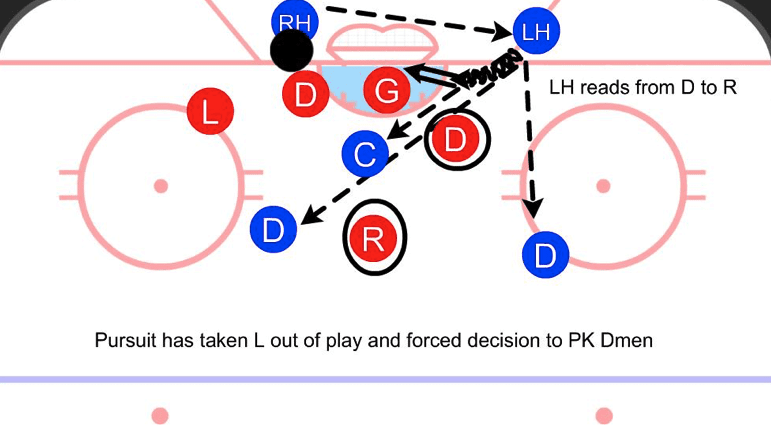 Not only in making better passes, but in also becoming a shooting option if play was switched to the opposite D.
Now we’ll walk through the various reads that make this power play work. Some of these reads will be against a Box Penalty Kill and some against a Triangle Plus 1. 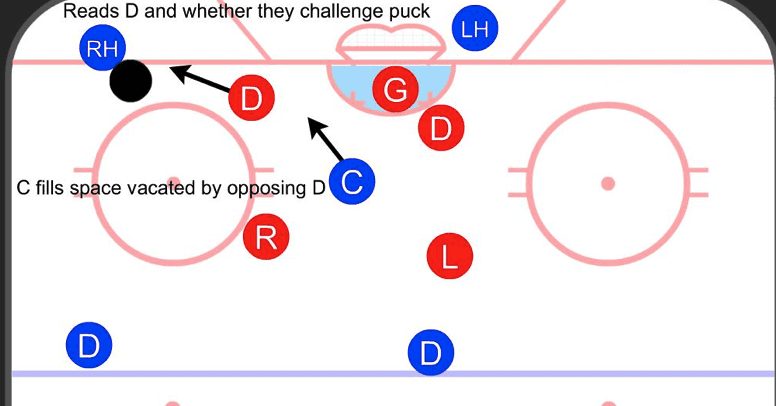 The puck carrier’s first read is the defenseman closest to him or her. If they come out to challenge, that will leave space for the center to fill for a quick shot. This is the preferred option as it’s the most direct and has the left-handed forward on the far post side if a rebound comes out of the other side. This type of approach will generally have a Box PK for lunch each and every time. However, the defending team could use a forward to press/push down (in a Czech Press) while keeping a triangle in front of the net, eliminating the option to the center. In this instance, passing to the closest defenseman is a solid option. Ideally, one of these players should be available. The key here is to pass and move. Encourage your players to pass and cut and it creates advantages all over the ice. If the RH forward passes to the nearest D and then beats his marker to the net, then it puts the opposing near-post defender in a bind. The D can walk down and shoot or pass to the forwards on either side of the net. If this play executes quickly enough, the forward that came out to press will be left out of position and ineffective. Here, the team on the penalty skill slides the weak side D over to mark the center. Now the puck carrier has to move the puck down low. 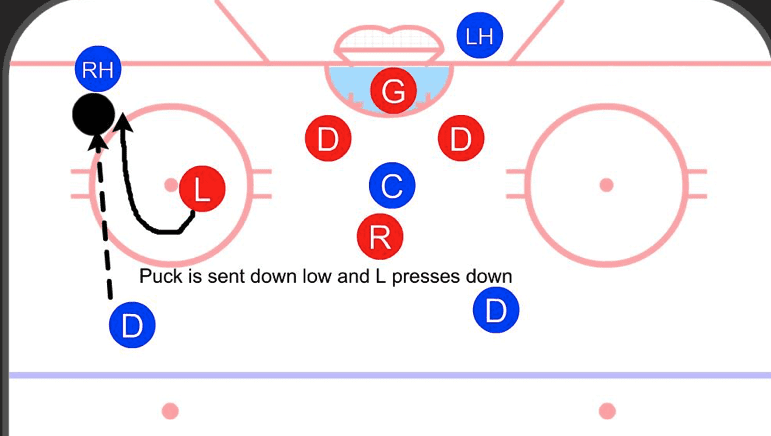 Whereas in a 1-3-1 if the center of the ice is clogged it limits the offensive team’s options except to go back to the point or if the net player pops out, here this formation offers a quick switch to immediately put pressure on the weak side forward in a 1v2 situation. If the puck is moved quickly, the left-handed forward below the goal line can try a jam play at the net or pass to the nearest defenseman, who will creep down into the slot. Now, you may run into a team that runs a strong and aggressive penalty kill and does it extremely well. A Czech Press can be difficult to break down, but moving the play down is exactly where we want to run this power play. We can actually use the penalty kill’s pressure against itself by encouraging players to exchange responsibilities. 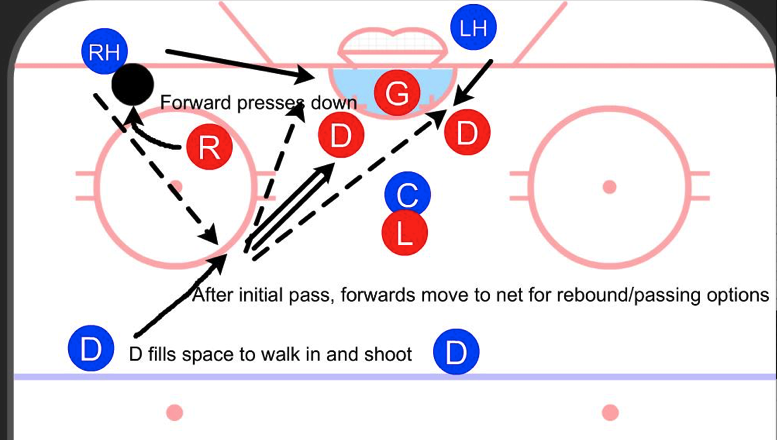 Here we see how a pressure PK would likely unfold as we enter, set up, and then send the puck down low. The PK is anticipating pressuring the puck carrier will result in a pass back to the point where the other PK forward (R) will pick up the pressuring responsibilities. However, if the puck carrier continues down low, they will attract continued attention from the nearside defenseman as well as the pressuring penalty killing forward. 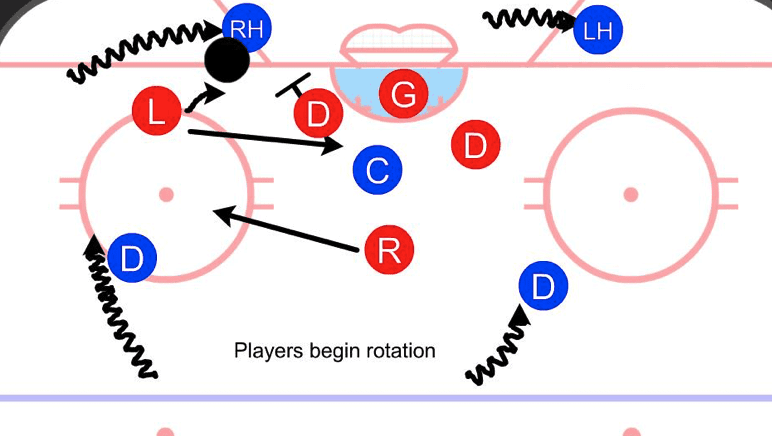 In the film room before the game, you would tell the offensive team to rotate as follows: defensemen drop down near the top of the faceoff circles either for a quick pass back from the puck carrier on the strong side, or a weakside one-timer option now or after the puck is passed to LH. LH gains some width to keep good spacing and not crowd the puck carrier. This also allows for an easy switch to run the PP from the other side. Finally, with the puck coming so close to the net, the strong side defenseman could jump out to pressure the puck. Now, this may leave the offensive C open at the net for a quick chance. Let’s assume the penalty-killing defenseman cuts that off. The puck carrier now has one player committed to him and another trailing the play (L PKer). A quick pass to the LH opens up options. Here, LH is reading if a jam play is open at the net. If not, then what is the penalty-killing defenseman closest to him doing? If they are cutting off the pass to the strong side D, is C open? The opposite? If D cuts off C and R cuts off the strong side D, can the weak side offensive D beat L back to the slot? With enough quick movement and the momentary occupation of both L and D by RH, we can turn the penalty killing pressure around and use it against them. These are just a few of the basic reads you can implement with this approach. Having the puck carrier and defensemen exchange both on and off the puck can create new looks. Having the center exchange with a player below the goal line or with a defensemen will confused defenders. A stationary power play is easier to defend, so make the penalty killers defend the entire offensive zone by using all of the space available. Furthermore, playing below the goal line forces the penalty killers to constantly be looking around. A traditional 1-3-1 keeps everything in front of the goalie, which is to the defending team’s advantage. This is a short excerpt from a larger piece I plan on releasing during the playoffs, but with how poor and unimaginative many power plays are at the highest level, new ideas can be unleashed on unsuspecting penalty killing units to devastating effect. If more coaches implement something like this next season, let me know how it goes! I’ve loved seeing other people have success with it. You can find me on Twitter at @RK_Stimp or reach me at hockeypassingstats@gmail.com if you have questions. Ryan has written extensively on hockey analytics since 2013. He has pioneered work in player evaluation and game strategy, leading the popular Passing Project for several seasons. 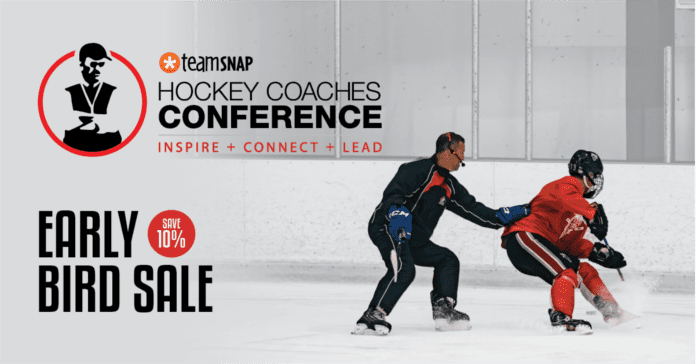 Ryan has contributed on analytics and published new research at Hockey Graphs, but also has written on using data to better evaluate hockey tactics. 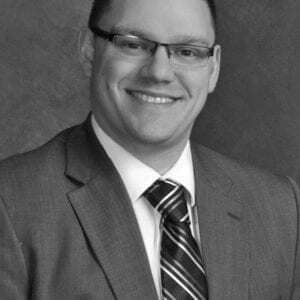 He consulted for RIT Men’s Hockey Team from 2015 - 2018 and coached a 14U team as well. 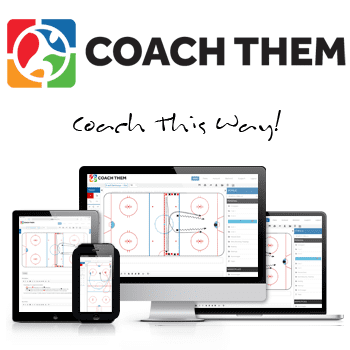 Ryan is a Certified Level III USA Hockey Coach. He has published a book you can buy on Amazon, Tape to Space: Redefining Modern Hockey Tactics, that draws on insights gained from data analysis to optimize how teams should play hockey.